Army women fly high: For the first time in the history of Sri Lanka Army, three women paratroopers passed out last Friday. Here the three women para-troopers after their jump - Captain Samangi Vidhanage, Corporal R.A.N. Hemanthi and Corporal Kalyani Kahawala of the Women’s Corp at the passing out parade held at the Sri Lanka Air Force Base in Uhana, Ampara. A big split in the United National Party is imminent. UNP National Organiser, S. B. Dissanayake, Kurunegala District Parliamentarian Johnston Fernando, former CMC Deputy Mayor Azath Sally and senior members of the party were absent at the UNP convention at the Nawaloka grounds, Mahabage, Welisara yesterday. The Tamil National Alliance (TNA) will meet tomorrow to discuss the invitation extended by the United People’s Freedom Alliance (UPFA) for talks over the forthcoming Presidential polls, according to TNA Parliamentarian Suresh K. Premachandran. The Eelam People’s Democratic Party (EPDP) has decided to support President Mahinda Rajapaksa at the forthcoming Presidential poll. EPDP General Secretary and Minister of Social Services Douglas Devananda told a media briefing in Colombo on Friday that the party will support President Rajapaksa at the Presidential poll. For the first time in the history of the Sri Lanka Army a woman officer and two women soldiers passed out as paratroopers and made their first aerial jump at the Sri Lanka Air Force Base in Uhana, Ampara on Friday. Capt M.N.S. Vidanage of the Fourth battalion of the Women’s Corp, Coporal R.A.N. Hemanthi of the Third Battalion and Corporal K.S. 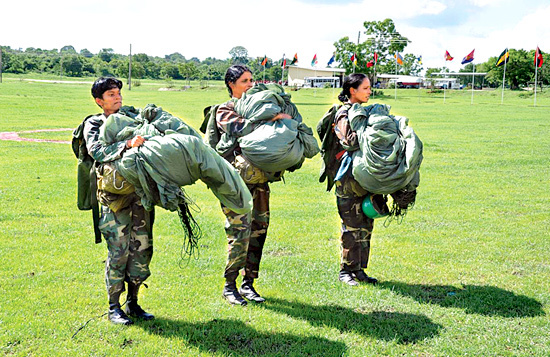 Kahawala of the Fourth Battalion of the Women’s Corp passed out as Paratroopers successfully completing the 52 Basic Parachute Course conducted at the Sri Lanka Air Force Base in Uhana, Ampara.